If you are a gout sufferer, you should consider keeping a journal. 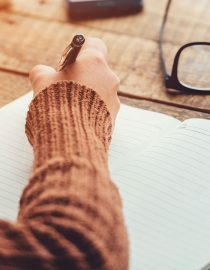 Journaling is about being accountable to yourself; it’s empowering because a journal helps you better understand your condition, make changes and live better, healthier. It is important, however, to know the right way to use it and what to write in it. Every single meal or snack you eat every day. Pay attention to the calories your consume and the foods that are high in purine. If you are not sure about how many calories a certain food has, you can check the USDA Nutrient Database. Regarding the purine content, you can review the list of allowed foods (which are low in purine) and the foods you should limit or avoid (because they have moderate or high content of purines). Write down where and when you eat. This is particularly helpful if you need to lose weight because you may notice late night snacks, eating at your desk while working or other unhealthy habits that don’t allow you to keep the optimal weight. You may also want to write down how are you feeling when you eat, as emotional eating can also make you eat more and choose comfort foods such as ice cream or pizza. What you drink. Include in your journal the amount of water your drink, because dehydration impairs the kidney’s ability to get rid of the extra uric acid. Alcoholic beverages and fructose beverages should be avoided. If you consume them you should write it down. Exercise. Record your activity levels and exercise, it will help you stick to fitness plan. Exercise helps you burn calories, keep your joints mobile and your entire body healthier. Sleep patterns. Write down about how you sleep and how you wake up in the morning. As much as your body needs activity, it also needs rest, too. If you experience a gout attack, look at your journal and see if you can find the trigger – it could be a high purine meal, alcoholic drinks, a new medication you received, or excessive stress. If you want to lose weight, keep track of your weight on a weekly basis as well. Since gout is a chronic condition, avoiding or reducing the frequency of flare-ups is a hallmark of effective gout treatment.